Ranveer Shorey plays Aman, a real estate agent who wants to get rich quick. His wife Divya (Neha Dhupia) is a television producer who disapproves of his schemes. When his one cheat-deal goes wrong, he has to find an even worse idea in order to get money lost. Of course things do not go well. What the audience can see from a mile away, the characters cannot. The film starts out well and quickly degenerates into a poor cousin of Khosla Ka Ghosla or Oye Lucky Lucky Oye..
Moh Maya Money is a bang for your new bucks! 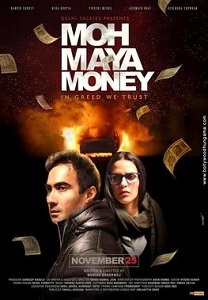 Money is the hottest topic in the Indian scenario today, and Moh Maya Money, a "white collar crime" drama, adds to the mass hysteria of the moment. But unfortunately, the hype of the film has nothing to do with the prevailing situation in the country. But his boss (Sandeep Narula) gets to know of Aman cheating the company and he sacks him from the job. Moh Maya Money' is a cluttered film, which could have ended up in a decent manner if only the direction would had been crisp and the screenplay was less cluttered.